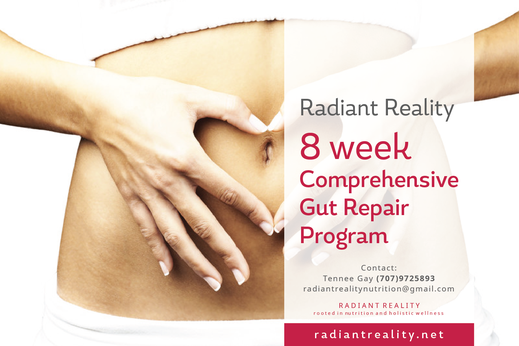 Radiant Reality 8 Week Comprehensive Gut Repair Program - Radiant Reality | Nutrition. Healing Arts. Inspired Living. Hippocrates, the father of natural medicine once said over 2500 years ago, “All disease begins in the gut.” Never have these words been more true than now. If you deal with digestive distress, you are not alone. More than 64 million Americans are dealing with digestive disease and almost everyone who eats the SAD diet (standard american diet) deals with some form of intestinal permeability or “leaky gut”. The reality is that most approaches to gut health offered by the traditional model involve “bandaids” that offer symptom relief but often fail to address underlying causes of distress to the system. GI health has become a foundational part of my practice as a FDN practitioner. I spent the past 8 years learning the foundational and pivotal role gut health plays in health. When you are able to put in place support to heal your gut, your whole body reaps the benefits! This is a custom tailored program geared to address causes of imbalance that may stem from stressors such as: infection, hormonal imbalance and diet to name a few. After identifying the hidden stressors I will provide you with information that will help you to support your detoxification system, remove foods that may be causing inflammation, eliminate the hidden stressors, and re-seed the gut in order to reestablish balance to your mucosal membranes. Due to the fact that any gut healing program is a process that requires time, this is a two month program with an initial consult session, results and recommendations session, and weekly check in's to make course corrections and adjustments as needed. The goal of my practice is to provide information that will both support you to take charge of your health and to make changes that will empower you in living a healthier and more vibrant life. Holistic Nutrition full body systems with Andrea Nakayama in preparation for FNLP certification.